She stresses that she’s not vegan, nor even vegetarian, but if a reducetarian means someone who shrinks the quantity of animal product in his or her diet, then King is a pretty strict reducetarian. She doesn’t have any cow or goat milk at home and she has throttled down her animal protein intake to near the vanishing point — a meal of finfish maybe once a fortnight. King is the author of Personalities on the Plate: The Lives & Minds of Animals We Eat, a sampling of the characteristics of the animals eaten by humans and an exploration of some of the reasons why vegans, vegetarians and reducetarians resist the temptations of eating flesh. But King also recounts in Personalities on the Plate the very moment in which she swore off eating chicken: It was after closing a book describing the horrors of industrial poultry practice. Her book’s chapter on chickens focuses on the fowl who manage to develop distinctive elements of personality despite generations of selective breeding. There’s even a bit on the famous Mike the Headless Chicken, who lived a reasonably full chicken’s life for more than a year after a botched beheading. “What then does go on in the chicken brain, given that Mike survived and functioned with only his brain stem? Quite a lot,” she writes, a segue into an exploration of neuroscientists’ discoveries of the complex and un-birdbrainlike avian brain. Each chapter recounts examples of animals displaying intelligence and individuality and of newly understood capabilities of animals revealed by science. Octopuses continue to amaze scientists with their problem-solving ability and King believes that a thoughtful omnivore should even rethink a fish dinner. Talking with her about that occasional meal of fish, it’s clear that King thinks about each one of those 26 fish that end up on her plate each year. She points to the overturning of a long-held consensus that fish don’t feel pain. “We now know that fish can, in some cases, play and use tools,” she added. In an afterword, King slices and dices the various attitudes, ideologies and philosophies toward eating animals and animal products. She explains what makes her “a reducetarian and not an abolitionist” and also why entomophagy — eating insects — gets her personal, if cautious, OK. 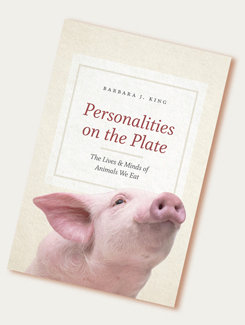 Personalities on the Plate, King said, is written for an audience of thoughtful human omnivores, potential reducetarian recruits who eat meat, and who might be induced to wonder about the rightness of it, but don’t have time to seek out articles in the scientific journals supporting evidence of animal individualism. She cited a thoughtful and favorable review of her book in The Washington Post by Virginia Morell, herself the author of Animal Wise: How We Know Animals Think and Feel. Morell’s piece restated King’s position on animal personalities from pigs to octopuses and even down to insects, written within a framework of a description of that night’s dinner, a favorite chicken dish prepared by her husband.